A beautiful five star hotel between Buckingham Palace and TrafalgarSquare, 2 minutes walk from Piccadilly and theatres, and a short tuberide from St Pancras International (Eurostar). 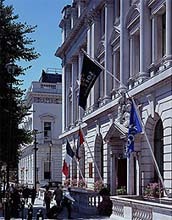 A Grade II listedbuilding, the Sofitel has 186 bedrooms and suites, Brasseri Roux - fromworld-renowned chef Albert Roux, serving new classic French cuisine,The Rose Lounge, St James Bar, and a leisure suite. The hotel is astylish venue for meetings and banquets, and comprises of 8 meetingrooms for up to 170 people. ST JAMES BAR : A cosy and traditional bar with fire place and cigar humidor. THE ROSE LOUNGE : An extravagant, chic retreat whereyou can enjoy the traditional afternoon tea accompanied by the subtleharmonies of our harpist. Rose Lounge provides an informal yet elegantmeeting place to get away from the hustle and bustle of the West End. BRASSERIE ROUX : This restaurant offers stylish surroundings. Enjoy traditional French cuisine created by the renowned chef Albert Roux. Because meetings should also mean meeting the criteria to guaranteesuccess, Sofitel has fashioned a new business meeting experience inprestige hotel venues based on the exceptional and the exemplary:luxuriously fitted spaces, first-class cuisine tailored to yourspecifications, and dedicated staff.